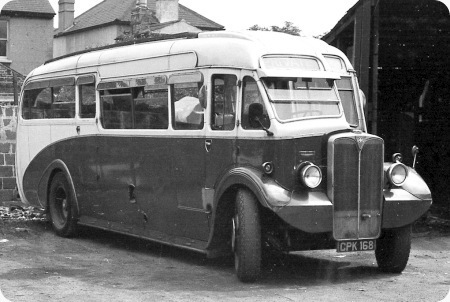 This picture, taken in 1960 or 1961, shows an AEC Regal of either late pre-war or early post-war vintage – the mechanical specification was virtually identical – with a straight stepped waistrail body of unknown (to me) manufacture. I would suspect that the chassis is of the usual 7.7/crash gearbox variety, but the front wing treatment is not of standard AEC pattern of the period. The number CPK 168 is a Surrey registration, and, when photographed, the coach was being operated by the once well known (certainly to the Traffic Commissioners!) firm of Margo’s of Thornton Heath, in whose Zion Place premises it is seen. Can our Forum experts supply more information? Gut reaction – a pre war Harrington. Those odd flat plates in front of the wings I suspect is an operator addition. The bodywork I am certain is by Harrington. It bears a very strong resemblance to some supplied to North Western on Leyland Tigers in the 1934-1937 period. Some of these were rebodied by Windover in 1950 and now I’m wondering if any of the original bodies were sold on for further use. Pure speculation of course, I don’t even know if this vehicle has its original body or not but although the mouldings are slightly different at the rear from the North Western ones, it is a faint possibility. The front wing treatment is obviously nothing to do with AEC, but an attempt to give a more up to date look, in fact, if the vertical part wasn’t so deep, it could almost be mistaken for a Regal III! Having had relations in nearby Streatham I have many vivid memories of seeing the Margo’s fleet in early postwar years – I have to say that the little quip about them being well known "to the Traffic Commissioners" comes as no surprise if casual observations are anything to go by !! By the way Joe, I know it takes some believing but nearside mirrors were not legally necessary until a date which just escapes me, but well after WW2. I just can’t imagine how anyone managed to avoid a "crushing" nearside accident for even an hour let alone day after day, and I certainly wouldn’t have liked it. Certainly in later years, Surrey Motors of Sutton were a consistent AEC/Harrington operator. Could it have originated with them? Chris- when you consider that there were then probably more bikes on the road, you had little way of telling who was coming up the inside- and on this photo but not pre mid fifties, no trafficator either. Your jacket may have had a white patch on the right arm for you to stick your arm out of the little window whilst getting 7 tons+ on to unassisted full lock…. but telling people on your nearside that you were turning left…? Perhaps that’s what conductors were for…?! I do concur with the view that this is a Harrington body – the cab design in particular does have the look of that coachbuilder. I went to school in neighbouring Selhurst, and I often saw the Margo fleet, including this Regal, round and about in the area. Later, I used to pop round to the Margo yard to see what they had acquired, and it was on such a trip that I luckily managed to get this photo. Often the gates would be shut and barred, probably to keep the Traffic Commissioner’s inspectors out as much as the general public. The transport press back in the 1960s and 70s regularly gave hilarious accounts of the skirmishes between Margo and the authorities. The excuses for the absence of drivers’ hours and fleet maintenance records always fell into the "dog ate my homework" category. Later, Margo rebranded as International Coach Lines, and bought a number of the early Bristol VRL double deck coaches. Chris’s point about nearside wing mirrors is correct. Even when they became obligatory some buses, including, surprisingly, those of London Transport, had miniscule postage stamp sized efforts on the nearside. That was a good idea about Surrey Motors: yes, it was their no 15, new in August 1937 and sold in May 1955 and it was indeed a Harrington body. Many thanks for that information, Michael. I often saw the smart AEC Regals of Surrey Motors in their primrose/brown livery during my schooldays in the Croydon area, and I did wonder if CPK 168 originated with them, but couldn’t find out much about the fleet history. I am surprised that this coach dated from as long ago as 1937, and it is a tribute to the quality of AECs and Harringtons of that period that it was still around in the early 1960s. In fact, given the standard of mechanical care meted out by Margo, its survival was little short of miraculous. Sadly, the Surrey Motors concern was taken over by Epsom Coaches (H. R. Richmond) in 1980. Tempora mutantur. Strictly speaking, Epsom Coaches only acquired the licences of Surrey Motors, not the business itself. Surrey Motors Limited also owned property and this became the primary concern after 1980. The original company (incorporated Feb 17th 1919) still exists as a subsidiary of the Stock Exchange quoted property company Panther Securities PLC but the only (and very tenuous) connection nowadays with the PSV world is that one of the shareholders in Panther also has shares in a number of bus companies. Re Surrey Motors. I see two of their preserved vehicles every year at the Goodwood (Motor) Circuit Revival Meeting. Pictures are here at this link. I’m certain that you know these coaches well but they will remind readers of the livery. Both are in splendid condition. Michael has dated the coach CPK 168 to 1937, but my records for it show it in fact to have been 2 years older, so new in 1935. It was one of four such coaches delivered to Surrey Motors that year, with fleet numbers 13-16, and registered CPH 624/5 and CPK 168/9. Dates I have are 5/35 for the CPH pair, 7/35 for the CPK ones, and these are shown as such in the list of pre-war AEC Regal chassis published in 2010 by the PSV Circle (publication C1131). The earlier dates also match with Surrey registration issues – during 1937 they had gone on to issue all the F multiples (FPA to FPL) and moved on as far as GPC. The Margo story is quite a complex one and starts with the activities of Nathan and Rose Margo who by 1920 had founded the business that was later to become Bexleyheath Transport. Several other members of the family ran other businesses later – I have some notes on the subject which I will look out and provide a summary during the next few days. Was it not Margos who ordered a large batch of Bristol LH/Plaxton coaches and then cancelled them when they were built? I drove DWT 641H at Stanley Gath Coaches of Dewsbury and I recall that Moxons at Oldcoates had DWT 643H. It may also be of interest that in February 1948 Surrey Motors sent CPK 168 to Watson & sons, Lowestoft for a complete body overhaul also adding one seat to become C33F. Further refurbishment was carried out by Harringtons in 1951. 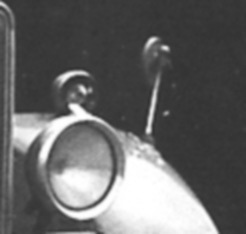 The vehicle was converted to diesel (probably 7.7 litre) by AEC in 1953. Articles about Surrey Motors of Sutton can be found in Buses Extra Nos 2 & 22 if that helps. The Margo story is worthy of a book on it’s own. I worked for Atlas Coaches of Edgware run by Michael Margo and his cousin Tony Plaskow. Michael was Cyril’s son who I believe was really called Isadore. Isadore and Gerald were the executors to Nathan’s will when he died in 1959. Louis (Lou) Margo owned Margos of Streatham, later renamed International Coachlines. He was assisted by his sons Nigel and Dudley. Bernard and Gerald Margo ran Bexleyheath Transport and I understand that Sally Margo operated as Paynes of Croydon. I am still in contact with Ronnie Dalton who still operates from the Nursery Road premises as International Coaches and worked for the Margo family for many years. There was also Malcolm Margo, these days known as Malcolm Morris with transport interests in the Channel Islands and another brother who I cannot recall who briefly worked as Transport Manager for Kirby’s of Bushey Heath in the 1970’s. Margos of Thorton Heath? that brings back old memories like when I was driving out of Merton for London Transport during a 60,s overtime ban a few of us went to Margo,s at Thorton Heath with the intention of recouping some of our lost earnings (from OT). My mates made a B line for the AEC Regents (preselect versions) I was too slow and got left with an ex Eastern Counties high bridge Bristol K to operate a school shuttle to swimming baths in Chelsea. I made my way there via Streatham and I shall never forget the cheering and clapping from the crews and inspectors outside A K garage as I made a pigs ear of the gear changes, thank God I mastered it by the time I got to Chelsea. Apart from Margo’s I remember (rather have dragged up memories from my schooldays over 60 years ago, 1948) Timpsons, Bourne & Balmer (Taken over by Timpsons) and much more ephemeral, Omnia coaches of Holmesdale Road Bromley. (grey matter now in gear), in particular not in own dark green were 2 ex LT (LTL) single deckers (Scooters) still in red with no signwriting petrol (still) used on schools work GO xxxx series from 1929-31. Can find little info on the latter company and even less photos (nil). I think (only think) they were taken over by Metrobus of Orpington. This vehicle was used in the mid 1930s to show a device that if fitted to the front wheels would stop a person been crushed. Thanks, Philip, and thanks also to Chris H who has put a link on Flikr to this site. Interestingly, the picture shows the Regal with its original Harrington front wing arrangement. Re comment 2/11/11 Paynes Coaches was owned and operated by Jack Payne from 1 Kemble Road Croydon packing up in the early 70s, and next door to him at number 3 was Taffy Thomas who ran just the one coach, the last being a Ford Plaxton 52 seater which he sold in November 1975. Margos provided a school coach from Mackenzie Road in Beckenham (just down the hill from their base) to Bromley Technical High School near Keston. I used it from 1960 to 1965 at 12/6d per term. My Mum would make me eat porridge in the mornings and what with being bounced around on the journey and the smell of the pig farm alongside the school, made for some interesting mornings! The driver was a Mr Farminer who would make sure we all sat in our allotted seats. On occasions a smaller coach would arrive and there would be a bun fight for the fewer seats. Inevitably there would be 3 of us on a double seat and 6 across the back. The best bit was sucking Jubbly’s on the way home in the summer!! My Father and Mother started the business known as Margo’s Coaches Streatham soon after their marriage in 1945, shortly after they purchased some land in Thornton Heath to garage the coaches. The main stay of the business was Workmen contracts School runs and Private hire. I joined the business straight after leaving school at the age of 14 when we expanded the business providing coaches for the incoming tourist trade, working with companies like Thomas Cook, Globus Gateway and Miki Travel. Trans World Coaches Ltd was sold to Trafalgar Tours International in 1981 at which time I severed all my connection with the business. I met Malcolm Margo in 1990 where he replied to one of my advertisements. Here began a long friendship. From memory his brother Michael was the only member of the family operating coaches out of South London. Malcolm and his cousins by then had pulled out of operating coaches. By contrast Malcolm took more interest in buying, selling, swapping coaches, cars, trucks sometimes under hilarious circumstances. In later years he enjoyed Guernsey where he carried on trading. Unforgettable character. Malcolm Margo/Morris legend lives on in West Africa. Bus operation, Trucking, Taxis, petrol stations. Not quite under a different guise….Anon too much history. I am surprised there is no mention of Margo’s Coaches located next to Brentford railway station. They were certainly there from 1966 to 1972. Their coaches four front wheels (singles) and the usual twins at the rear. The coach colour was an attractive redish brown. One of the Margo family was with me on National Service in the RAF in 1954 – 1956.